I have decided to continue the day-to-day travel log. The last post travel log post described the second day of the trip, in which my travel companions and I had spent the day botanizing with a friend in southeastern Colorado. 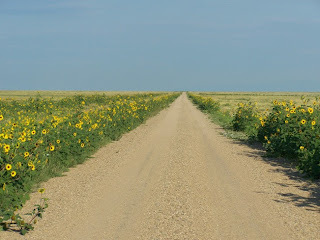 We left the Comanche National Grasslands via a sunflower-strewn road. 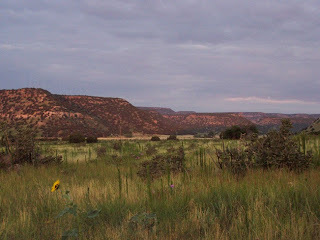 From the grasslands we headed to the town of Trinidad, CO. We had two objects in Trinidad, breakfast and a new tire. 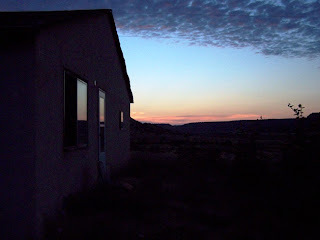 My traveling companion, Q, had been in this town before and described it as a rough and tumble town, reminiscent of the old west. While it was calm and quiet on that Saturday morning, it looked as if Friday night was rough. At least 13 windows of downtown businesses appeared to have been busted with a baseball bat. Several business people were out and about boarding up their windows. 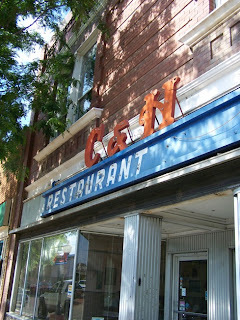 We did have a lovely breakfast (burritos covered in chili sauce) at the C and H restaurant downtown. And we lucked out on the tires at the local Wal-Mart. 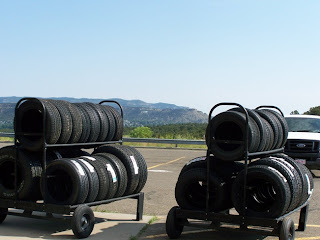 Apparently the tire we needed is not normally kept in stock, but a woman had ordered them but then decided not to buy them. So after an hour delay we were back on the road. 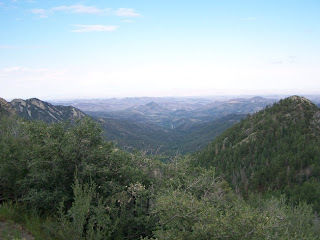 Our final destination was Lake Roberts, NM, located in the Mountains near the Gila Wilderness Area. After driving all day through New Mexico (including the town of Truth or Consequences), we arrived at Emory Pass, which goes over the Continental Divide of the Mimbres Mountains. The view was gorgeous. The road from Truth or Consequences to Lake Roberts (which was one of our base of operations for this project), was a windy mountainous road, but absolutely gorgeous with wildflowers. 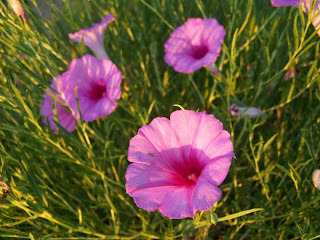 Luckily, I was not driving and thus I was able to look at the plants. We arrived in Lake Roberts at around 7:30 pm. There we met up with the rest of the field crew and had a great dinner.